Washington, Feb 12 (IANS) Venezuela's self-proclaimed acting president, Juan Guaido, will ask for the support of OAS to restructure the country's electoral authorities and organise new elections in the Andean nation, his envoy has said. "This is a visit prior to the formal request that is going to be made to the Organization of American States by President Juan Guaido to ask for the cooperation of the OAS in conducting the next Venezuelan electoral process," Efe news quoted Gustavo Tarre as saying to reporters on Monday. He confirmed that the request will be made this week. Tarre spoke on Monday with the secretary for the strengthening of democracy at the OAS, Francisco Guerrero, to whom he also expressed Guaido's interest in asking for an observer mission for a future election. "First, we want to reconstruct the electoral branch and an electoral mechanism that will be trustworthy, where not the slightest doubt exists that the will of the voters will be reflected in the results," he added. Tarre said that a process will be launched for selecting the members of an independent electoral authority, moving toward a new list of voters and creating a voting mechanism. The United States, Canada, numerous Latin American countries and the major European powers all consider leftist President Nicolas Maduro's May 2018 re-election victory to be tainted by fraud and have recognized Guaido, speaker of the opposition-controlled National Assembly, as interim president. On a related matter, Tarre said that a small portion of the humanitarian aid now sitting in a warehouse in the Colombian border city of Cucuta will enter Venezuela "at the end of this week or the start of next week." "A complex logistical process" is under way regarding the aid, he said. "Because we have to position the aid and also guarantee that once it crosses the border we have organisations from civil society that will distribute the goods," said the delegate, who added that it is expected that the trucks will enter through the border crossing points with Colombia and Brazil. Although he admitted that any mobilization of aid depends on whether the military allows it to pass, he expressed confidence that there would be no obstacles. "I don't see a Venezuelan soldier halting with a rifle someone bringing food to his dad, his mom, his kids and his siblings," he said. Maduro has thus far used the military to block the aid from entering Venezuela, denying that the country is suffering a humanitarian crisis and saying the delivery of the shipments would be a prelude to a US-led military intervention. On Monday, Venezuelan Defense Minister Vladimir Padrino said that his country has a "strengthened (military) presence" along the border with Colombia after a portion of the humanitarian aid had begun to be warehoused in Cucuta. Guaido, meanwhile, said on Monday that the first shipment of the humanitarian aid had already been received. 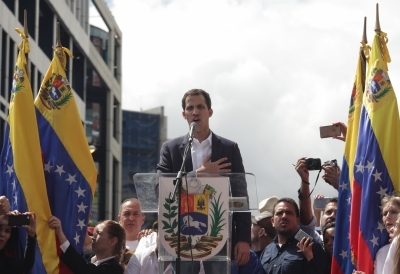 "Today we're receiving the first shipment of humanitarian aid items from the Health Centres Association (ASSOVEC) with 85,000 supplements, which translates into 1.7 million food rations for children and 4,500 supplements for pregnant women," Guaido said on his Twitter account. Sri Lanka mulling burqa ban?